Belleek dinnerware includes complete table settings from plates to teacups and is augmented with table accents such as salt and pepper shakers and gravy bowls. 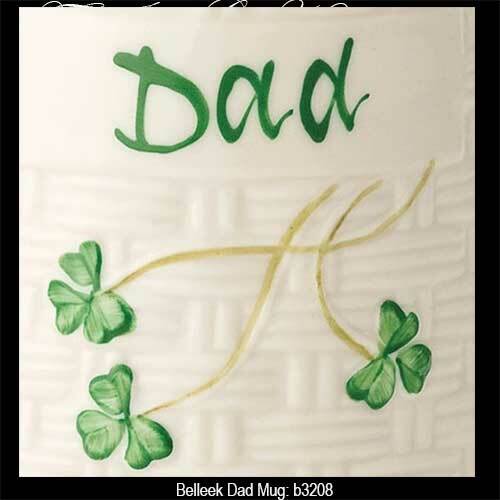 Most of this fine Irish Belleek china displays their famous hand painted shamrocks. All though Belleek is one of the thinnest and most translucent china in the word, it is meant and designed for everyday use in the dining room and kitchen and it is safe in the dishwasher, the microwave, the oven and the freezer. 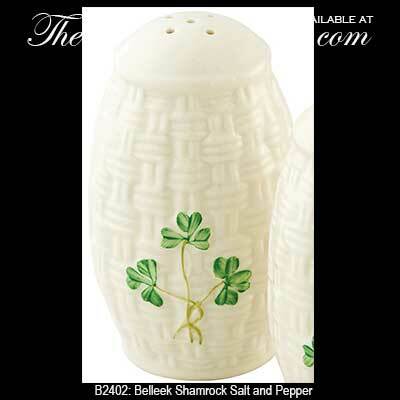 Add an Irish accented piece of Belleek dinnerware to your kitchen or select complete place settings for all your guests. 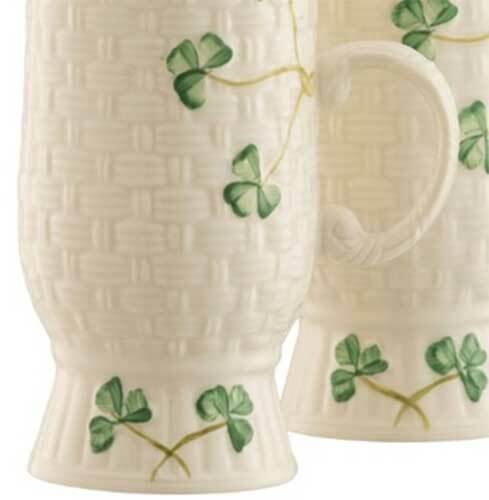 Belleek Irish coffee mugs feature shamrocks along with an embossed basket weave design on fine china. 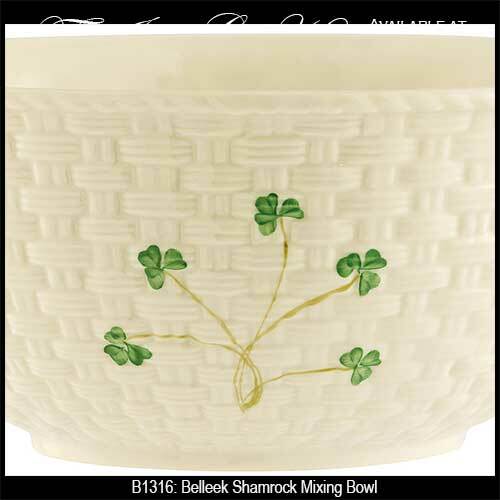 This Belleek dinnerware features a 6" bowl that is enhanced with shamrocks along with the basket weave motif. 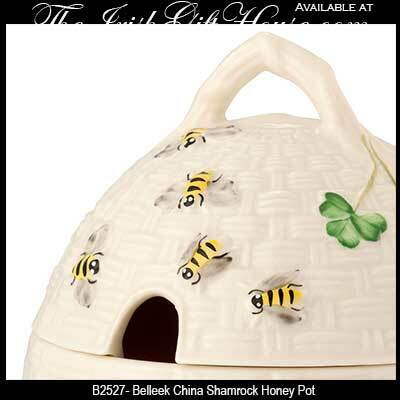 From the Belleek tea pots to the Belleek pitchers this assortment of fine Irish china from The Irish Gift House is destined to become family heirlooms. Grace your table with complete Belleek table settings and accent it with complementing pieces such as the Irish salt and pepper shakers. 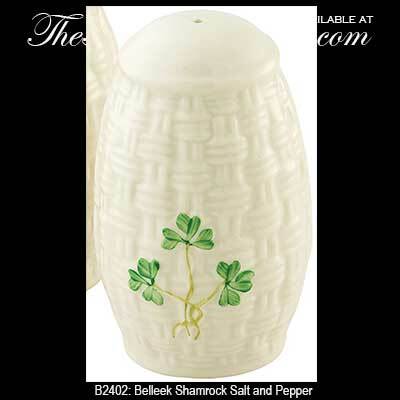 Additional settings for your table are available in our Belleek Claddagh dinnerware page where you will find selections that feature the iconic Irish symbol that represents love, loyalty and friendship. 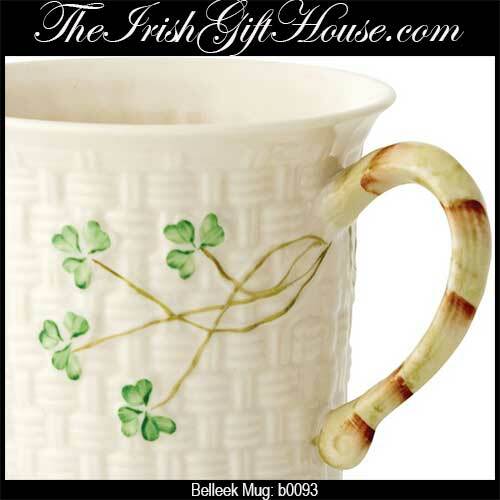 You may also wish to browse our Irish kitchen gifts for additional ideas in the line of Irish dinnerware including our selection of Irish tea towels and table runners.